The 2010 Deepwater Horizon (DWH) disaster released more oil into the Gulf of Mexico than any other spill in United States history. When oil spills happen, one of the first things responders do is refer to their guidance documents about which response tools (e.g., dispersants, booming, skimming) to use under which conditions (e.g., the type of oil, temperature, wind speed). The goal is to guide responders to select tools that will effectively minimize risks to humans and ecosystems, especially sensitive areas such as coastlines. No matter who wrote these guidance documents—industry, government agencies, or the National Academies of Sciences, Engineering, and Medicine—they all pretty much say the same thing: Oil floating on the sea surface is going to spread fast, some will evaporate, and the rest will be eaten by microbes. Notably, none of these documents recognized the major role of sunlight in the fate of oil spilled into marine environments. This ostensibly means that all response tools should be used equally, no matter if it is a sunny day or a cloudy day. 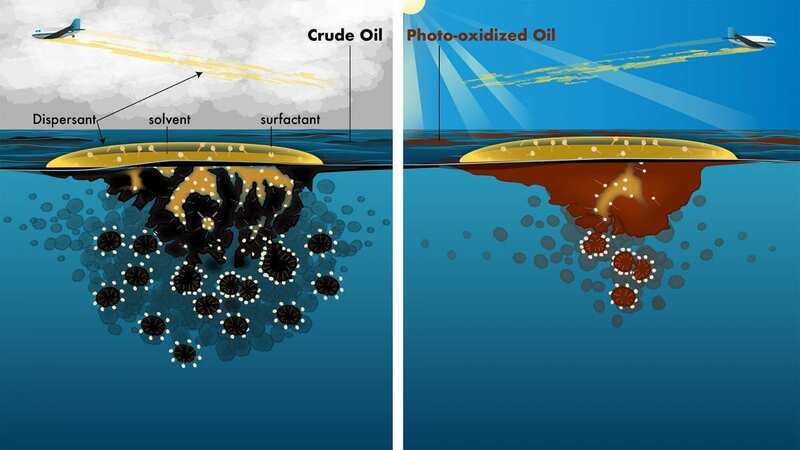 We just published two papers that say the oil spill community has been underestimating the role of sunlight all along. The first study, published in February 2018 in Environmental Science & Technology, shows that 50 percent of the oil floating on the Gulf of Mexico was chemically altered (or weathered) by sunlight in a few days. Importantly, sunlight does not remove oil from the sea surface, as evaporation does, so we still have to effectively clean up the sunlight-weathered oil. The second study, published April 25, 2018, in Environmental Science & Technology Letters, shows that chemical alteration of oil by sunlight significantly lowers the performance of chemical dispersants, a response tool that helps break up oil into droplets and lessen the amount of oil that reaches coastal ecosystems. People want to know: “How did all the guidance documents get it wrong?” The answer really boils down to not having an opportunity to study how oil reacts with sunlight in the field. 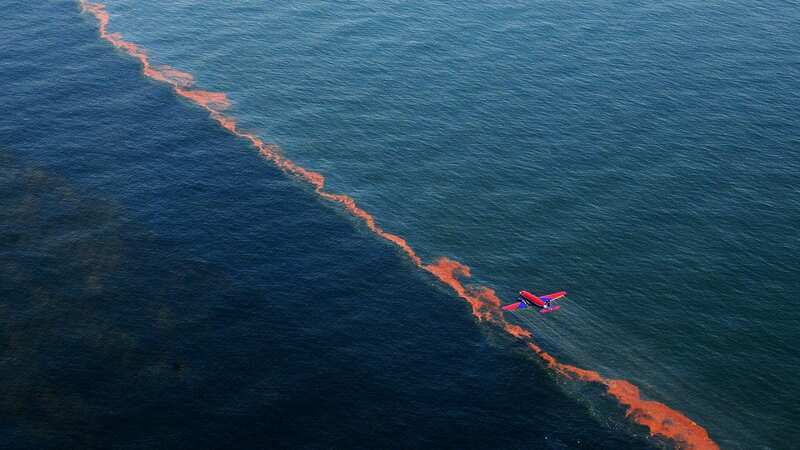 In the early 1970s, several scientists, well before their time, reported that oil spilled into marine environments could be transformed by sunlight, resulting in the production of compounds that have more oxygen in them (i.e., photo-oxidation). However, making the leap from the lab to the field is extremely challenging. It demands the analysis of hundreds of field samples collected across a wide range of space and time; nuanced and intricate photochemistry experiments; and interdisciplinary modeling efforts. The first step to making this leap is showing that the longer oil floats on the sea surface, the more it becomes oxidized—a relationship that had never been reported for any oil spill anywhere in the world. Why? Because large, offshore spills like the DWH are extremely rare. The DWH spill released nearly 500 million barrels of oil and gas into the Gulf of Mexico. The oil floated on the sea surface for 102 days. This provided responders an opportunity to skim oil off the ocean at different time points, which we then analyzed for its oxygen content. In contrast, most spills take place close to the shore and abruptly release only a small amount of oil. By the time the responders get to the spill, most of it is stuck to sorbent booms or washed up on the beaches. Those samples, skimmed off the sea surface by first responders, were a gold mine for research. For the first time, we were able to report a strong link between the length of time that oil remained on the sunlit sea surface to the oxygen content of that oil. The fact that the oil was oxidized was not too surprising (think back to the studies from the 1970s), but the amount of oil that was oxidized and how fast the oxidation happened certainly caught us, and the oil spill community, by surprise. At least 50 percent of the oil floating on the Gulf of Mexico was chemically altered in less than five days. The only hitch was that we didn’t know how it was oxidized. The two options were sunlight or marine microbes. The guidance documents told us that microbes were the likely culprit, so we checked them out first. We analyzed hundreds of samples for dozens of chemical markers of biological degradation. We found very little evidence for biological degradation while the oil was floating on the sea surface, at exactly the time when the oil was oxidized. Despite what the guidance documents told us, microbes weren’t the primary driver of oil oxidation on the sea surface. Logically, the next question we asked was: Is photo-oxidation fast enough to account for the rapid oxidation that we detected on the sea surface? This question is incredibly complicated and called for a diverse group of collaborators, including aquatic photochemists, analytical chemists, modelers, and remote sensing experts. In total, our team was made up of ten scientists from seven different institutions, including the National High Magnetic Field Laboratory in Florida and Bigelow Laboratories in Maine. If you figure these four things out for all 102 days that the oil floated on the Gulf of Mexico (which is a non-trivial exercise), you can calculate the potential for sunlight to add oxygen to floating oil. It turns out that the potential is enormous. In fact, all lines of evidence from the field, lab, and modelling efforts point toward sunlight, rather than microbes, as the primary driver of oil oxidation on the sea surface. Now that we established how and how fast the oil was oxidized, we started building our case for why the oil spill community should care about oil photo-oxidation. Oil spill response tools are evaluated on “fresh” oil that has not been altered by sunlight, yet for the DWH spill, the cleanup tools were applied to sunlight-weathered oil. This discrepancy motivated us to question the accuracy of the guidance documents that tell us that sunlight-weathering doesn’t impact the performance of oil spill response tools. The tool we tested first was chemical dispersants. We assembled another diverse team of scientists, this time including experts in oil spill response from the U.S. Environmental Protection Agency (Robyn Conmy) and oil spill modelling from industry (Deborah French-McCay, RPS Ocean Science). Together we found that the equivalent of a few days of sunlight exposure decreased the effectiveness of chemical dispersants by at least 30 percent. The results from the lab were similar to results from the field, which led us to the conclusion that sunlight was a primary factor driving aerial dispersant performance. Next, we embarked on a modelling effort to estimate how widespread this lower-than-expected dispersant performance could have been for the DWH spill. 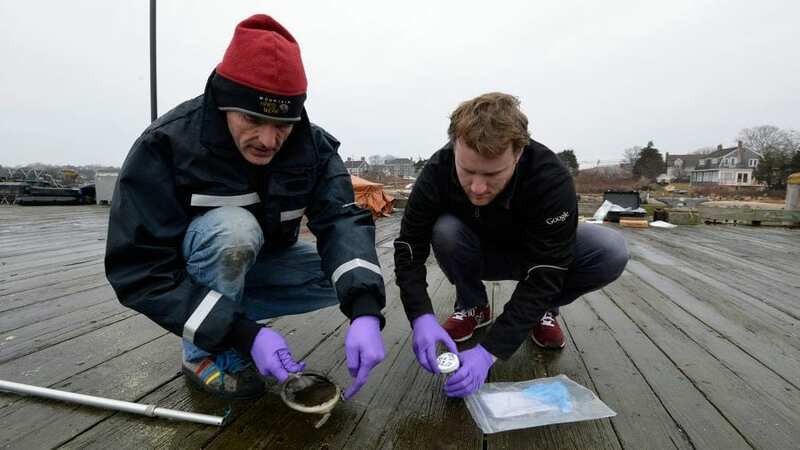 The results showed that under average wind and sunlight conditions, the majority (hundreds) of dispersant applications would not have achieved even the minimum effectiveness levels designated by the EPA, because they targeted photochemically weathered oil. 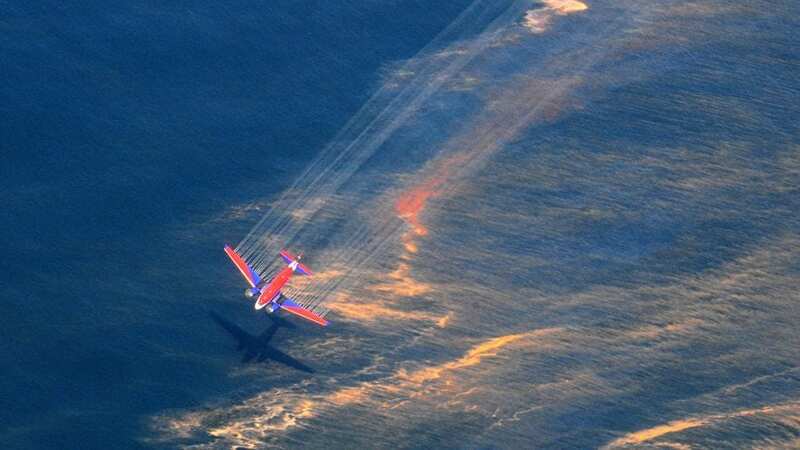 Even under the best-case scenarios for aerial dispersant spraying—cloudy weather (which would limit photochemical weathering) and high-wind conditions (which would transport oil farther from the spill area before sunlight transformed it)—dozens of aerial dispersant applications still would not have achieved EPA-designated effectiveness levels. We expect that some people are going to leverage this study into negative statements on dispersant use. This would be unfortunate. The goal of this study is not to pass judgments on the pros and cons of dispersant use. Instead, we are simply providing more knowledge to help officials refine decisions on using dispersants in ways that are most effective. Notably, our study provides a solution for the lower-than-expected dispersion of photo-oxidized oil. Our results suggest that the dispersant solvent system is not compatible with the oil, which hinders droplet formation and dispersion into the water column (see interactive graphic). We offer this solution with a great deal of caution: it’s conceivable that the knowledge gained from our work could be incorporated into novel dispersant formulations designed specifically for photochemically weathered oil. Before we jump the gun and start reformulating dispersants, there is a lot more research that needs to be done. 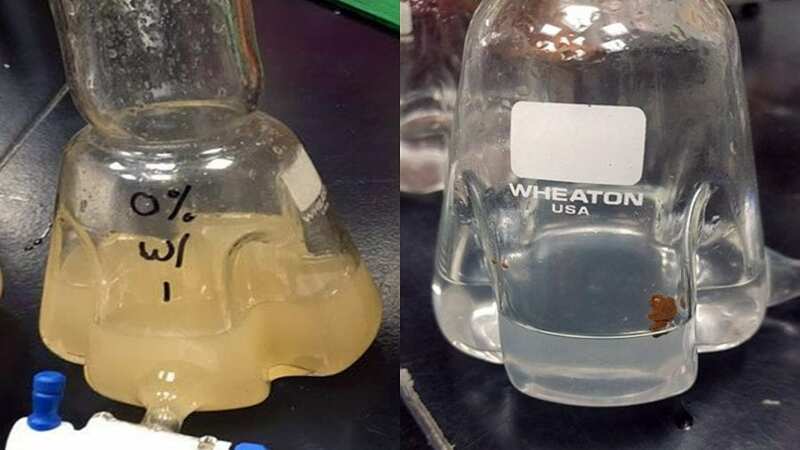 First, we need to figure out how photo-oxidation varies for different types of oil—from heavy, sour bitumen oil from the Canadian tar sands to light, sweet oil from the Bakken oil field in North Dakota. 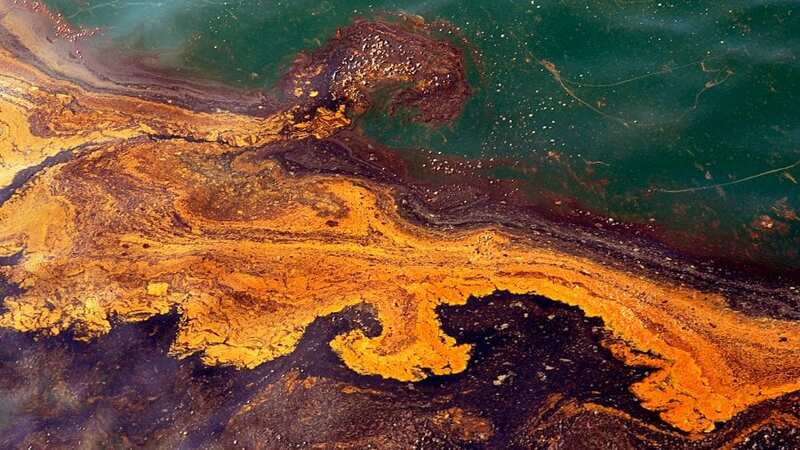 Next, we need to figure out how oil photo-oxidation impacts a wider range of oil spill response tools—from chemical agents, such as herders and surface washing agents, to tools to physically remove oil, such as sorption and skimming. Lastly, we need to put all this information together and write algorithms to calculate how fast various types of oil will oxidize in different waters on Earth across all seasons. That will allow us to tailor more effective response plans for future spills. The times are exciting—but nerve-wracking too! This is not a game or just another means to publish more papers or secure more research funds. The stakes are high. Oil spills pose major risks to humans and ecosystems. Oil spill cleanups are extremely expensive, and they will continue to occur, at least in our lifetimes. Our line of thinking is simple: Accurate oil spill response guidance documents translate into effective oil spill response and risk mitigation. 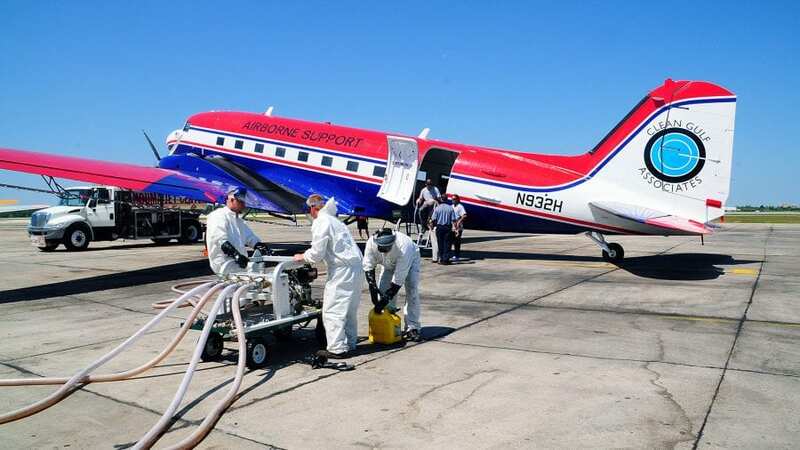 Did Dispersants Help Deepwater Horizon Responders Breather Easier?